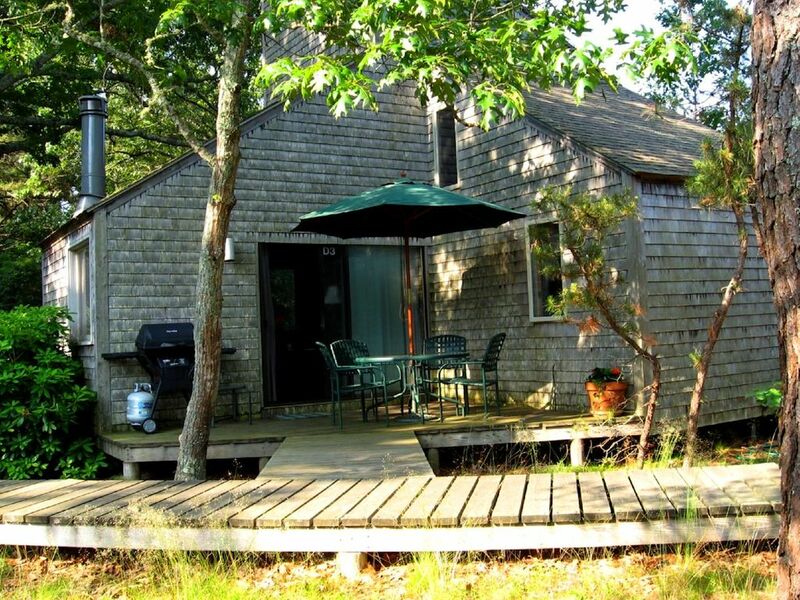 Experience quaint Wellfleet in this cozy cottage surrounded by nature. Enjoy cathedral ceilings in the living room, 1st floor bedroom, and upstairs loft. The living room has all leather furnishings with a cozy fireplace. A spiral staircase leads up to a beautiful sleigh bed in the loft with ceiling fan. Cook in the fully equipped eat-in-kitchen or grill (gas) outside on the deck. Relax and enjoy the view on the nicely furnished back deck or take a leisurely stroll on the woodsy boardwalk that surrounds a small pond (this pond is not for swimming) A small walkway connects the deck to the boardwalk. Both living room and the 1st floor bedroom have cable TV with VCR or DVD players. A large selection of DVD and VHS movies are supplied. This cottage is located near the ocean side and bay side beaches plus freshwater ponds and is only a short distance to Lecount Hollow Beach, PB Boulangerie French bistro & bakery, the Cape Cod Rail Trail (bike trail), a deli and other small stores. Comfortably sleeps 4 with a queen bed in the loft and 2 twins in the 1st floor bedroom. A coin operated washer and dryer is located in the club house. WIFI. We grabbed this last minute for a week in Wellfleet. Very conveniently located. A short walk to the head of the bike trail and PB Boulangerie. Short drive to beaches and town. Things to know that aren't immediately clear from the ad. It is in a complex of small cottages called Deck 2. All of the cottages are connected by a boardwalk that goes around a small pond. It was clean and comfortable. The beds are relatively firm. The place is very small. Probably best for a couple or a couple and some small children (we had 2 teenagers with us and it was a bit cramped). The upstairs bedroom has no walls between it and the downstairs so no privacy for whoever sleeps upstairs. The stairs to the upstairs are very narrow so not for those unsteady on their feet. Kitchen table and the living room area couches are for 3 people (ie 3 kitchen chairs and a chair and a loveseat in the livingroom). The kitchen has a good assortment of pots and pans. All the cookware and silverware is Walmart quality as you might expect, but it didn't bother us at all. Don't plan on making major meals in the kitchen. Overall, it was fine for a nice, quiet getaway and was reasonable for the price. Very cute cottage. Very clean and the beds were very comfortable. We arrived to a vary cute cottage. The kitchen was well stocked. The bedrooms were large with very comfortable beds. Free WIFI and local channels on the TV made everyone happy. Very close to all beaches on the National Seashore. The deck with patio table was great for reading and eating. The new grill was easy to use. No AC made record high dew points nights difficult for sleeping but I was able to catch up on my sleep by taking naps at the beach. The cottage is directly off RT 6. The traffic can be heard but very quiet overnight. It's cozy and very convenient. Only two downsides: it's close to Route 6, so you notice the traffic noise early in the morning, and there is no air conditioning. However, the absence of air conditioning would not have been an issue if most of our week wasn't stifling hot and humid, to an extent not usual for the Cape. The Deck properties are unique in that they feature access to a boardwalk around a small kettle pond which seems pristine. Overall, really nice. Floor to ceiling knotty pine with spiral staircase to second floor loft bedroom gives this rental an elegance that is truly Wellfleet. You are living in a Pitch Pine forest bordering a small ancient kettle pond with a meandering board walk which takes you close to birds, turtles, and frogs - without the presence of mosquitoes ( an outer cape benefit). Well appointed kitchen, comfortable beds, roomy bathroom with tub w/ shower. Although near to route 6, not much road noise due to lower elevation from Rd. Bike to bakery, rail trail (1/8 mile south on Rt. 6), ocean beach and kettle ponds (1 mile) Cotton Tail Rd, left on Old County, right on road to Calhoon Hollow, White Crest , etc.. Good times. Property was as described, very clean, good customer service from owner with local attractions, restaurants, and beach info. I would recommend to friends...but not Red Sox Nation friends, as that channel was not available to watch games (the only downfall of the week). Loved the Beaches, especially Newcomb Hollow, and all the restaurants were very good, and conveint location to condo. We certainly would rent again if they get the Red Sox channel!! !